What Hope Is There for Art Education? On one point at least, all who care about art education agree: the future of instruction in the visual arts in our nation's schools is at risk. Arts advocates generally target the No Child Left Behind Act of 2001 (NCLB) as the chief threat to be reckoned with. A recent Brief issued by Americans for the Arts, for example, declares that although NCLB includes the arts among the core academic subjects, implementation of the bill has resulted in "the erosion of arts education." Testing under NCLB, its critics argue, has had the unfortunate effect of favoring instruction in reading and math at the expense of other subjects. That view is held by many art teachers, who hope to modify the law when it comes up for re-authorization. I argue here, however, as I have done elsewhere (see Where's the Art in Today's Art Education? and Rescuing Art from "Visual Culture Studies"), that the most serious threat to education in the visual arts is internal, not external. Such instruction is being destroyed from within by questionable premises and inappropriate content. Ironically, clear evidence of that threat is discernible in the very proposals to amend NCLB that are being offered by a National Education Taskforce on the issue. Spearheaded by Dennis Earl Fehr (an associate professor of "visual studies" at Texas Tech University), the taskforce has proposed new language for the section of NCLB dealing with the arts in education. While purporting to highlight the "importance [of the arts] to children's development," (1) the proposal in fact ignores what is distinctively important about the arts. Both by what it says and by what it fails to say, it is symptomatic of what poses a far greater long-term threat than NCLB to the future of the visual arts, not merely in the sphere of education but in the culture at large. The proposal begins by recommending insertion of a clause defining the arts as "creative activities and products of the theater, the visual arts, dance, music, and multimedia combinations of the above," and another clause requiring that "all children [be] taught the arts by arts specialists." The key questions for art education remain to be answered, however: What qualifies as visual art? And what qualifies someone as an art specialist? To teach children to interpret media messages critically, arts curricula shall include study of mass media, visual culture, popular culture, government documents, educational materials, and entertainment and commercial productions, with age-appropriate attention given to how these means of visual communication manipulate arts and aesthetic content to influence thought and emotion. compare the ways in which a variety of ideas, themes, and concepts are expressed through the visual arts with the ways they are expressed in other disciplines. Similar goals are included in the National Standards for Arts Education. Yet the taskforce proposal flouts them in its emphasis on "interpret[ing] media messages critically." To create a civically engaged and ethical citizenry, study of the arts shall include age-appropriate examination of social justice and ethical questions posed by artworks throughout history and across world cultures. But is the goal, however important, of creating a "civically engaged and ethical citizenry" the proper focus of the art classroom? And should art teachers be professionally concerned with "social justice" (the theme of next year's National Art Education Association convention)? Or do such issues belong within the province of social studies teachers--who presumably receive the appropriate training to deal with the complex and often contentious questions involved? Moreover, shouldn't works of art be understood as far as possible in the light of their own cultural context, rather than through the lens of the "social justice and ethical questions" they appear to pose from our cultural perspective? Again, the taskforce proposal flies in the face of the National Standards--which stipulate that students in grades 9-12, for example, should be able to "differentiate among a variety of historical and cultural contexts in terms of [the] characteristics and purposes of [their] works of art," and should be able to "describe the function and explore the meaning of specific art objects within varied cultures, times, and places" (emphasis mine). In seeking to expand the content of art education to cover issues such as "social justice," the taskforce reflects a bias that has been evident in the field for some time. That trend has gone hand in hand with another, equally inappropriate--the virtually wholesale embrace by art teachers of contemporary forms of expression that have little or nothing in common with the traditional visual arts of drawing, painting, and sculpture. In truth, new genres such as "performance art," "installation art," and "video art" originated as expressly anti-art gestures, and therefore shun the attributes of traditional visual art. Further, they often encroach on the terrain of primarily nonvisual media of expression such as film and literature. As I argued in the two articles cited above, many art teachers appear to ignore, even reject outright, the qualities that distinguish the visual arts from other art forms and other disciplines. Having embraced as "art" the anti-art forms invented by postmodernism, they have readily shifted to concerning themselves with all of "visual culture." And having lost the powerful emotional connection that can be found in works of art, they are easily lured by the siren song of "social justice," which purports to lend new moral weight to their profession. Any doubts one might have had about these trends should be laid to rest by the March 2008 issue of the National Art Education Association (NAEA) journal Art Education--a special double issue devoted to "contemporary art" in the classroom--and by the letters responding to it in the September 2008 issue. The prevailing view among art teachers in both issues is that virtually anything can qualify as "visual art." When I showed the March issue to friends of various professional backgrounds (one of whom obtained a Master's degree in the teaching of art a decade ago, but has been working in industrial media production), they could not believe that it represents what now passes for art education in some schools. After leafing through the various articles, they commented, in particular, on the nearly total absence of illustrations of actual works of art. The only examples of the traditional visual arts of painting and sculpture were in the two illustrations accompanying "What About the Other Face of Contemporary Art?," which I co-authored with Louis Torres. All the other articles dealt with or referred to postmodernist genres such as "sound art," "installation art," "conceptual art," and "video art" (the term "contemporary art," as we argued, has become virtually synonymous with such anti-art genres for many art teachers), or were concerned with popular forms of expression ranging from "sticker art" and cartoons to "graphic novels" (all of them more dependent on words than on imagery to convey their meaning)--or with "visual culture" in general. In the same issue, an advocate of postmodernist work in the classroom observed that the "main problem with contemporary art is most people don't acknowledge it as art." (4) That writer was Annette Lawrence, a painting instructor at the University of North Texas, whose own work includes "elaborate string installations in public venues." Her view was clearly echoed in another article, entitled "The Trouble with Contemporary Art Is . . . " (ellipsis in original). Its authors were Pat Villeneuve, an associate professor of art education at Florida State University, and Mary Erickson, a professor of art education at Arizona State University. The trouble with "contemporary art," they argued, lies not with "challenging works of art" (such as the "[stymying] conceptual, performance, [and] installation art" they cited) but rather with the many people who fail to respond to such work because they "are not equipped to deal with it." (5) In Lawrence's view, moreover, "getting young people adjusted early to the idea that [such work] is also art is the most important [thing]" for teachers to be doing with respect to contemporary art in the classroom. Given that most of the "challenging works" are in forms that began as intentionally anti-art gestures, however, getting students used to the idea that they, too, are art would be the equivalent of a math teacher's getting students used to the idea that 2 + 2 = 5. If that were what most math teachers were doing in the classroom, would any responsible person be saying that what we need is more of the same, by math "specialists"? Following the publication of the March 2008 issue of Art Education, Torres and I received three e-mail messages from art teachers around the country, thanking us for our article and applauding our insistence on the importance of teaching the traditional skills of drawing, painting, and sculpture. They gave me some hope that a fair number of teachers in the K-12 trenches might be unhappy with the recent trends exemplified by the journal's content. Alas, that hope faded in the glare of the September issue. Of the twenty-one letters that were published commenting on the March issue--most of them by NAEA members teaching on the college or university level--the overwhelming majority were enthusiastic about the content, lauding it in terms ranging from "awesome" to "a tremendous teaching resource." Only two of the letter writers were critical of what their colleagues have embraced as "contemporary art." The first was Rick Jacobi--a former commercial artist who teaches at a Michigan charter school specializing in the arts. One of the three teachers who had written to Torres and me, Jacobi praised our article as "diametrically opposed to the majority of the material" generally found in the journal--much of which, he accurately observed, "falls into the category of anti-art." The other critical letter was from a retired NAEA member, Bob Lloyd, who taught for many years at the high school level in New York City. Echoing Jacobi's sentiments, he provided a historical perspective by pointing out that "the original impetus for including . . . Art Education in the public school curriculum at the turn of the century [was] diametrically opposed" to what advocates of visual culture studies in art education now argue for. Whereas the original aim was to provide children with the sort of "elevating experiences of seeing and knowing about great masterpieces of Art" that might foster the "spiritual awakening of a higher consciousness," the present desire is to immerse them in the "crass, commercial, creepin' meatballism of pop-culture." The term art education, he concluded, "has now become an oxymoron." Yet another critic of current trends in the field is a young high school art teacher in Georgia, who wrote to us only a few days before this article was published. Thanking us for the March 2008 article, which she had just read, she lamented that both MFA and Art Education programs now favor only "conceptual" work--which they regard as "new and riveting," while ignoring that students often lack such basic skills as drawing from observation and are therefore at a loss to convey their ideas effectively. Still more disturbing is evidence in the recent pages of Art Education that the "visual culture" approach is becoming, in the hands of some teachers, a vehicle for inculcating their own economic and sociopolitical views. Consider, for example, an article in the November 2008 issue entitled "Build-A-Bear Workshop: Its Aesthetic and Ideology"--by You-Jin Lee. A doctoral student in art education at the University of Illinois at Urbana-Champaign, Lee is presumably an art specialist in the making. The apparent motivation behind Lee's critique of the Build-A-Bear Workshop enterprise--whose stores enable children to assemble personalized teddy bears--is a Marxist-inspired censure of the "capitalist ideology of consumerism" (p. 23) and of the way in which capitalism delivers goods and services to the public. Her critical perspective, I should note, clearly reflects the views of her mentor, Paul Duncum, a professor of art education at Urbana-Champaign who is one of "visual culture" studies' most zealous advocates. Setting aside extra-artistic questions that might be raised regarding Lee's anti-capitalist bias, I would ask, What does her article have to do with art education? Not very much. Nor do today's purported art educators necessarily content themselves with mere censure or verbal critique of the social, political, and economic problems that they aim to solve. An "Instructional Resource" in the July 2009 issue of Art Education recommends teaching high school students about the "street art" of the British practitioner Banksy (the pseudonym he uses "to avoid legal prosecution for vandalism," since his work is "illicit and subversive in nature") to inspire them to do their own. 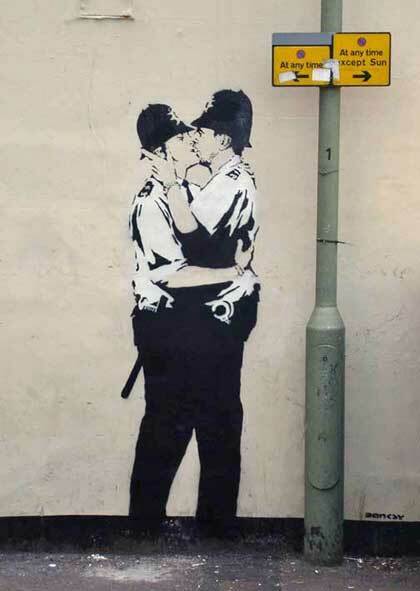 The Banksy images to be studied might include one of "kissing policemen"--which "forces pedestrians to revise their conceptions of homosexuality and masculinity." Or students might reflect on Banksy's street-art protests against the barrier erected by the state of Israel to protect its citizens from terrorist attacks. They would then stencil T-shirts with an image they have drawn to "illuminate or challenge . . . a questionable social practice." Finally, they would be urged by their teachers to "wear their designed T-shirts as human billboards while soliciting comments or reactions from the public"--since the "ultimate goal of the studio project is to allow students to enter the real world with their art to increase public awareness about important social issues." (6) The professor who devised this lesson directs the graduate program in art education at the University of Houston and is thus engaged in training the next generation of art teachers. But the crucial fact is that the "conceptual art" cited in the lesson--works by Jennie Holzer and Barbara Kruger--has no proper place at all among the visual arts, which convey their meaning through imagery. Holzer's pieces are entirely verbal, and Kruger's likewise depend heavily on the printed word. Any imagery she incorporates is appropriated from other sources, and her pieces deliberately imitate advertising, not fine art. Such postmodernist work is nothing more than a glib and simplistic form of public text messaging. It meets the standards of no art form, either visual or literary. As for the whole bogus genre of conceptual art (in which the visual embodiment of an idea is held to be of so little importance that it can be dispensed with entirely), teachers should understand that it was from the outset a dysfunctional reaction against the unmerited artworld stardom of Abstract Expressionism, and was, in both intent and effect, anti-art. (7) A sane reaction would have been to return to representational forms of painting and sculpture, which some twentieth-century artists had never abandoned. Such forms have always conveyed ideas. They are, therefore, truly conceptual art. Their meaning is conveyed through visual, not verbal, means, however--through images, not words. That is why they are called visual arts. That should not be an approach that art teachers encourage their students to emulate. Yet emulate it young people very likely will, if they are led to believe that it will gain them recognition in today's culture. Why bother to master the arduous discipline of painting or sculpting the human form if one can garner praise by throwing shapes at a wall and making a "game" of it? The "correct" answer is of course b. Many important questions appear to have been overlooked, however. If the work is merely an exploration of pure form, why did Noguchi title it Kouros? And if he meant the work to represent or suggest a youth, why do art historians and critics regard it as an exploration of pure form? Still more important, is such "exploration" a proper undertaking for the art of sculpture? Or should works of art deal with things of human import and value? If as I surmise the "correct" answer is meant to be c, it is historically misleading, for it falsely implies that biblical themes were in themselves of little significance for Renaissance artists and were a mere excuse to "explore" the human form. 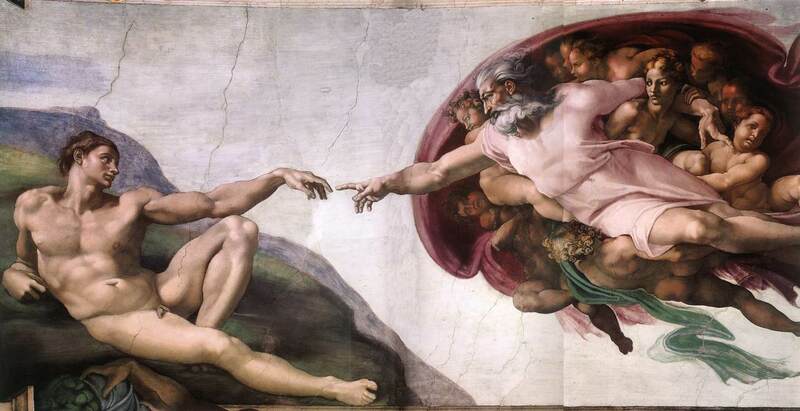 The truth is that Michelangelo, like most other artists of his time, was both classically inspired and profoundly religious; his images of man were not only shaped by classical ideals regarding the human form but were integrally related to his religious beliefs. Traditionally, drawing has been defined as marks made on a two-dimensional surface. However, contemporary artists have now broadened our definition of drawing. For example, Anthony Gormely [sic] draws with a single strand of aluminum rod approximately one inch square and nearly three miles long. . . .
No, drawing has not been traditionally defined merely as "marks made on a two-dimensional surface." It has been defined in such terms as "the art of representing objects or forms on a surface chiefly by means of lines" (American Heritage Dictionary of the English Language, 4th ed., emphasis mine). If one omits the essential aim of representation, "drawing" becomes a meaningless enterprise, as it surely is in the work of Antony Gormley (see the examples on his website). As long as art teachers are guided by the sort of flawed reasoning evidenced in the examples I've cited, they will be actively engaged, however unwittingly, in undermining art instruction in our schools. Without both a clear understanding of just what constitutes visual art and a firm conviction concerning its value, there is little hope of saving art education--regardless of No Child Left Behind. Lacking such understanding and conviction, moreover, teachers will not only continue to serve as accomplices in the legitimization of bogus art in today's culture but will, in many cases, resort to engaging in highly inappropriate political and social indoctrination. Further Readings on Art Education by Michelle Marder Kamhi and Louis Torres. 1. Dennis Earl Fehr, "Developing Arts Education Policy at the Federal Level: The First 10 Months of the National Education Taskforce," National Art Education Association, Studies in Art Education (Summer 2008), p. 382. 2. On the primarily literary nature of the art of film, see Torres & Kamhi, What Art Is: The Esthetic Theory of Ayn Rand (Chicago: Open Court, 2000), pp. 253-61, and the sources cited there. 3. The reasons why architecture should be regarded as a species of design, not an art form, are discussed in chapter 10 of What Art Is. See also John Silber's Architecture of the Absurd, reviewed by Louis Torres ("At His Father's Knee") in this issue of Aristos. 4. Annette Lawrence, interviewed by Sara Wilson McKay in "Education as Installation Art and Other Useful Ideas from the Contemporary Art World," Art Education, March 2008, p.72. 5. Pat Villeneuve and Mary Erickson, "The Trouble with Contemporary Art Is . . . ". ibid., p. 92. 6. Sheng Kuan Chung, "An Art of Resistance: From the Street to the Classroom," Art Education, July 2009. 7. On the postmodernist reaction against Abstract Expressionism, see What Art Is, pp. 270-73; and Thomas McEvilley, The Triumph of Anti-Art: Conceptual and Performance Art in the Formation of Postmodernism (Kingston, N.Y.: McPherson, 2005), pp. 100-101. 8. New York City Department of Education, Comprehensive Art Examination: Three Year Concentration for Regents Credit (2006), Part I - Art Concepts, Question 29. The 2006 exam is no longer available online, but more recent exams can be found at http://schools.nyc.gov. 9. Elizabeth Murray (1940-2007), in "Elizabeth Murray: 'Bop' & the Process of Painting," an interview broadcast on the PBS series Art:21. The only televised series "to focus exclusively on contemporary visual art and artists in the United States," Art:21 provides educational materials developed for classroom teachers and students. The only work dealt with, however, is "cutting-edge" or anti-traditional. Contemporary artists working in the traditional genres of painting and sculpture are never featured.